“You do a fantastic job, we are proud of you”. This was the emotional comment of EUAM’s Jose-Antonio Carrasco, the Regional Outreach officer in Dnipropetrovsk, at the end of an intensive two-hours meeting with the regional headquarters of the Ukrainian (free) Legal Aid Foundation (FLA), involving Nina Tutova, its Deputy Director. A limpid success story, with an enormous potential in the context of a post-revolutionary transition and of a persisting conflict with all its social and economic consequences. 170 selected lawyers deployed in the 8 local centres of the Oblast (around 4000 at national level), assisting the weakest section of society in more than 20000 criminal and administrative cases in the last two years, plus over 400 ones in the civil sector, which legally came into the FLA agenda just a month ago. And a phone number (0 800 213103) available h24 for police and judicial officers as well as individuals. “A new generation, a new mentality”, underlined Anton Prokopenko – in charge of the quality control over the legal assistance – who also welcomed the adoption, last July 2nd by Verkhovna Rada, of the amendments to the law on prosecutor’s office reform. “It takes the representation of citizens’ instances out of that office”, he said, with an immediate impact against the corruption in the judiciary and on the protection of their rights (the percentage of acquittals significantly rose). The FLA was established in 2011, upon the new Code of Criminal Procedure. It is centrally managed at the Ministry of Justice, and receives relevant funding and training by the United States, Canada (“representing its model”) and Denmark. The “socially vulnerable people” under his assistance include special categories (e.g. orphaned children, detainees, war veterans) and the broad sector of families who earn less than 1200 Hryvnias (about 50 Euros). Internally Displaced Persons are involved, provided they fill in the salary edge. “We have big hopes for the future but our main concern is to restore people’s confidence”, added Mr. Prokopenko. The regional headquarter has no communication sector. The work is largely done at the local centres (where the EUAM staff has been finally invited), involving the whole activity of networking with officials, media and NGOs. This is a crucial part of the success story and of its potential development on a wider level. 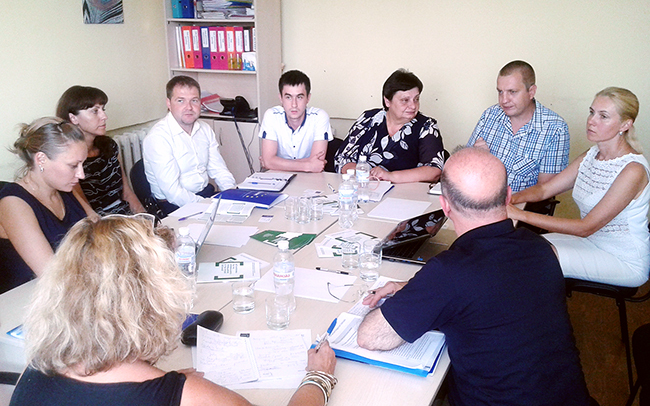 “An advice on communication from EUAM would now be a priority for us”, admitted Prokopenko. EUAM Legal Adviser Rita Tamm agreed on that, and furtherly noted the crucial need to contribute with a “sustainability plan”, so that the new good training and assisting practices can be held and reproduced once the international funding will end.